The Major League clubhouse at the Mets Spring Training facility in Port St. Lucie, Florida, will already feature a few new faces in Robinson Cano, Edwin Diaz, Jed Lowrie and Wilson Ramos. On Thursday, the club added two Top-100 prospects and a former NFL quarterback to the mix. 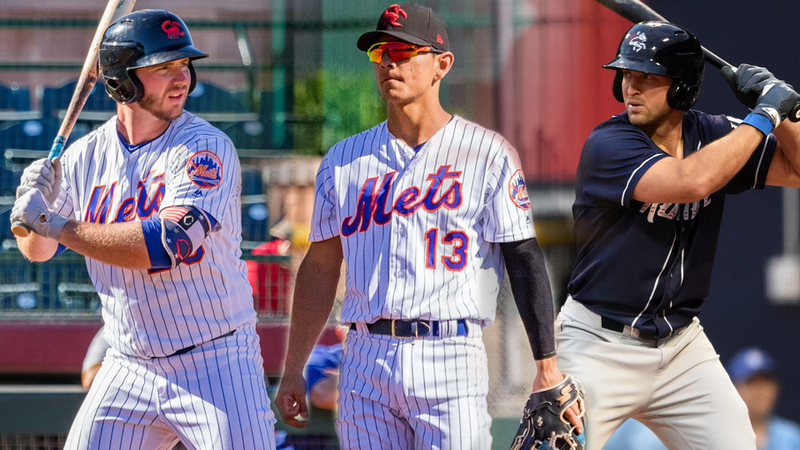 First baseman Peter Alonso, shortstop Andres Gimenez and outfielder Tim Tebow were among the 13 players who received non-roster invitations to the Mets' Major League Spring Training camp on Thursday, the organization announced. From a baseball perspective, Alonso is the more prominent former Florida Gator getting his first call to Major League camp. MLB.com's No. 58 overall prospect is expected to compete for the Mets' first baseman's job with Dominic Smith and the newly acquired J.D. Davis following his breakout 2018 season. The 24-year-old right-handed slugger tied for the Minor League lead with 36 home runs over 132 games between Double-A Binghamton and Triple-A Las Vegas while batting .285/.395/.579. Alonso followed the regular season with a trip to the Arizona Fall League, where he put together a .255/.339/.510 line with six homers and seven doubles in 27 contests. Steamer projections expect Alonso to be New York's best option at first base as well as the team leader in homers, should he get a full slate of Major League plate appearances. It's more likely he'll open with Triple-A Syracuse and make his big league debut in late April, when the Mets will have secured an extra year of team control. Gimenez, the game's No. 55 overall prospect, is a level behind Alonso in Major League readiness. The left-handed-hitting shortstop played the entire 2018 season at age 19 and hit .281/.347/.409 with six homers, five triples, 29 doubles and 38 stolen bases over 122 games between Class A Advanced St. Lucie and Binghamton. He also rounded out the year with a trip to the AFL, but struggled at the plate with Scottsdale, hitting just .125/.250/.292 in 19 games. Gimenez currently stands out more for his defensive work, with both of his glove and arm tools considered plus. He's primarily played shortstop during his three seasons in the Minors but also spent time at second base in the AFL. Despite their prospect status, both Alonso and Gimenez are likely to be overshadowed in the Grapefruit League by the arrival of Tebow in his second stint as a non-roster invite. The 2007 Heisman Trophy winner played all of the 2018 season in the Eastern League, where he earned his first career All-Star nod. The 31-year-old outfielder produced a .273/.336/.399 line and six home runs in 84 games with Binghamton before a broken hamate bone in his right hand ended his season in late July. He will likely join Alonso on the Syracuse roster. The other Mets non-roster invites are left-hander P.J. Conlon, left-hander Anthony Kay, catcher Patrick Mazeika, left-hander David Peterson, catcher Colton Plaia, right-hander Ryder Ryan, catcher Ali Sanchez, right-hander Corey Taylor, right-hander Joshua Torres and right-hander Stephen Villines.